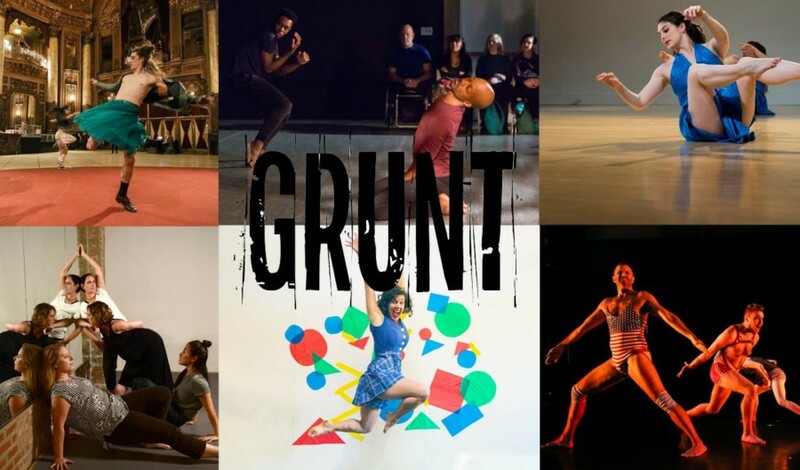 Local dance makers The Space Movement Project, Ashley Fargnoli and J’Sun Howard have teamed up to produce GRUNT Festival Chicago as part of Links Hall’s 40th anniversary season. The 2-weekend event features five visiting artists engaging in the national exchange program, GRUNT (Grass Roots US National Tour). GRUNT seeks to support underrepresented emerging and mid-career artists to build opportunities and resources to tour across the country. For the first time in its three-year history, two weekends of performances will bring together seven local choreographers and visiting artists hailing from New York, Boston and Minneapolis. The Space Movement Project will present Six of One, an in-progress improvisational score in which dancers perceive the sensory feedback of singularity within a pairing. Featuring original sound design by Chicago-based composer Shelly Steffens. Patriot Erectors a new performance work by the April Sellers Dance Collective examines the root of our disconnection to national identity. It is inspired by the fourth of July, the star-spangled banner, and the rainbow flag. At a time when our country is most divided and our leadership is invested in separating people based on identity, we seek to ask the question: Can you be queer and be a patriot and what does it mean to be a queer American? Deconstructing acts of nationalism from marching in the streets to singing of the National Anthem, Patriot Erectors explores both celebration and protest. Developed at the Center for Performing Arts, Minneapolis, premiered at in the Dancing Queerly Festival at the Dance Complex in Boston. Now more than ever when queer identities and freedoms are being challenged and are in threat of being erased we need art that questions the queer identities relationship to patriotism. Sarah Weber Gallo presents FUNHEAD, a clubland fairytale dance about all things FUN. And youth. Characterized by risk, excess, effort, and gigantic messes, FUNHEAD sends dancers careening through layers of resistance headlong into the arena of fun and smack into the gritty aftermath. Or, another Saturday night and I ain’t got nobody. J’Sun Howard was recently selected by adjudicators of the Detroit Dance City Festival to participate in an exchange program to South Korea next year for Daejeon’s New Dance Festival International Festival. A Links Hall Co-MISSION Fellow, a Ragdale Foundation Sybil Shearer Fellow, 2017 3Arts Make A Wave Awardee, and 2014 Chicago Dancemakers Forum Lab Artist, J’Sun’s choreography has appeared at venues such as Links Hall, DanceBox (Kobe, Japan), Ruth Page Center for the Arts, Sonotheque, Lincoln Square Theatre, Insight Arts/Center for New Possibilities, Epiphany Church, Rumble Arts, Defibrillator Performance Art Gallery, Patrick’s Cabaret (Minneapolis, MN), and Danspace Project (New York City), The Arts Club of Chicago, and The Art Institute of Chicago. He has performed for several choreographers including Malcolm Jason Low, Asimina Chremos, Sara Wookey, Paige Cunningham-Caldarella, Selene Carter but most extensively with ongoing collaborators Darrell Jones, Damon Green, and DJ Justin Mitchell in their research of (e)feminized ritual performance, which received a 2013 Juried Bessie Award for Hoo-Ha (for your eyes only). J’Sun has facilitated workshops in Vogueing Aesthetics, Dance Composition and Improvisation at Indiana University, DanceBox Kobe, and Beloit College. The Space Movement Project (TSMP) is dedicated to nurturing the collective female lens in contemporary dance movement. TSMP has performed work in Massachusetts, North Carolina, Illinois, Wisconsin, Michigan, Ohio and New York as well as Puebla, Mexico. Operating as a collective of dance makers, TSMP has presented the findings of its unique artistic model at the Bill Evans Somatic Dance Conference, Elon University and Beloit College and has been commissioned by the City of Chicago Department of Cultural Affairs and Special Events. From 2010-2017, the organization managed OuterSpace Studios offering subsidized space rental to over 200 dance, theater and visual artists annually. TSMP co-launched the GRUNT network in 2017. Ellice Patterson, director of Abilities Dance, focuses completely on inclusion in her work. By working with a variety of abilities, she aims to utilize each dancer’s strengths to create professional level pieces. She believes in partnering with composers to create original music that complements the movements, as opposed to the often reverse of movements complementing the music. This way she can truly focus on the value of elevating different dancers’ strengths to tell a story. In our integrated modern genre, we have utilized the home base genre of our dancers to influence our pieces (ballet, classical Chinese dance, and more) to really bring dancers’ voices to light. Her pieces all tell stories that are universal to the human experience: understanding religion, romance, and everything in between. By utilizing mixed abilities dancers, she overall tells the powerful story that everyone experiences the same triumphs and tragedies. Therefore, she fosters understanding and promotes the mission of increasing inclusion for folks with disabilities. Formed by April Sellers in 2000, the April Sellers Dance Collective (ASDC) is nationally recognized for their gender-bending, feminist-infused performances. Led by Sellers’ choreography and fueled by community participation, the ASDC’s work has long explored sexual identity (Jousting, 2014 and In Her Place, 2000), queer feminism (Big Baby, 2014 and Double Drag, 2015), and the vulnerability of the body (The V Project, 2007). ASDC celebrates complex expressions of gender and identity in their highly-crafted performances. Sarah Weber Gallo is a principal dancer with the Metropolitan Opera Ballet, where she is currently dancing in her 20th season. Notable choreographers and directors include Christopher Wheeldon, Benjamin Millepied, Julie Taymor, Doug Varone, Graciela Danielle, Mary Zimmerman, Carolyn Choa, Robert Lepage, and André Serban. Other performing credits include Donald Byrd/The Group, American Dance Machine for the 21st Century, and the Radio City Rockettes. She formed SWG/dancetheatre in 2013 upon completion of her MFA at the University of Wisconsin at Milwaukee, and has built a robust body of work in collaboration with her team of dancers and designers that has been described as punk rock opera. When not performing or creating work, Sarah can be found in Hoboken, NJ directing MST Dance Academy and chasing around her saucy 9-year-old daughter. Molly Hess is a choreographer, dancer, and educator. In 2018, Molly was commissioned by sculptor Fitzhugh Carol to create an interactive site-specific performance. In 2017 Molly created “Lost Gnome solos” and showed work as part of the Tracks touring artist program in Boston and Pittsburgh. In 2016, Arc Dance Research Laboratory selected her as the emerging artist in residence. Also in 2016, Molly toured the performance “Molly + Tessa Make a dance” around the East coast.” Molly’s work has been presented regularly in the Greater Boston Area and beyond. Besides having a dedicated independent choreographic practice, Molly is a founding director of 3 Spice Dance, a member of Back Pocket Dancers, and PB&J Dance Company. She teaches dance with a focus on the creative process. Molly received her B.A. in dance from St. Olaf College. Molly also wears an administrative hat as part of Bearnstow on Parker Pond.